The collaboration of the OCIANA and the DASI projects has led to availability of a numbr of Dadanitic inscriptions in the DASI archive. 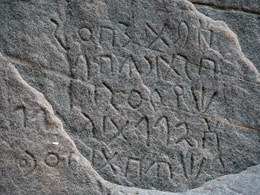 The Corpus of Oasis North Arabian Inscriptions is made up of the inscriptions in the Ancient North Arabian alphabets used in the oases of Dadan (modern al-ʿUlā), Taymāʾ, and Dūmah (modern al-Jawf). These differ in a number of ways from the alphabets used by the nomads of ancient North Arabia and southern Syria. A few ONA inscriptions have also been found in southern Iraq and on some seals of uncertain provenance.